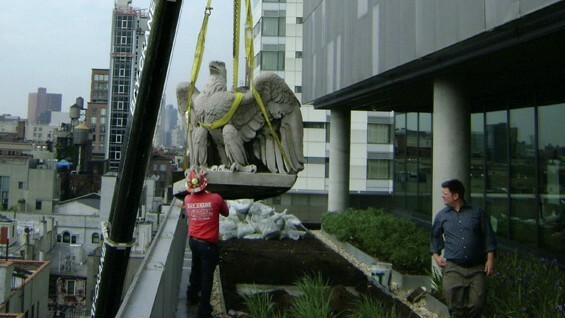 Cooper Union Eagle Takes Flight! 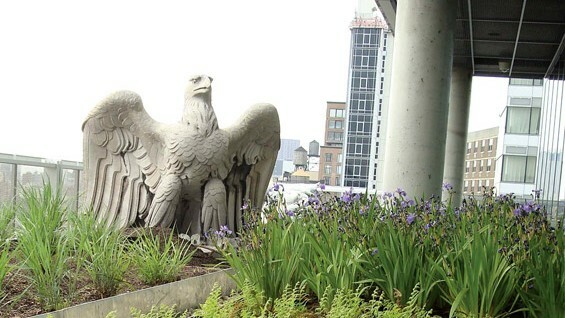 The three-ton historic marble Eagle, a longtime resident and namesake of Cooper Union’s Eagle Garden, moved this summer to a new roost on the Green Roof of 41 Cooper Square. The Eagle, one of twenty-two original eagles sculpted by 1891 alumnus Adolph Weinman, guarded the McKim, Mead and White Pennsylvania Station from 1910 to 1963, and was acquired by The Cooper Union in 1965. A group of students from The Irwin S. Chanin School of Architecture, led by Joe Zelvin (AR’65) and then Dean of Students Dr. Richard S. Ball, petitioned the Pennsylvania Railroad to receive and rescue this piece of New York City history. The 2009 class gift is helping to fund the Eagle’s flight from the engineering building to the south-east corner of 41 Cooper Square’s 8th floor.